Lines to Jack's Sensation H, Mr Koscot[TWH], President's Mr. Jack, Mr. President, Southern Sunrise, Southern Jazz, Missouri Traveler E, Zane Grey. 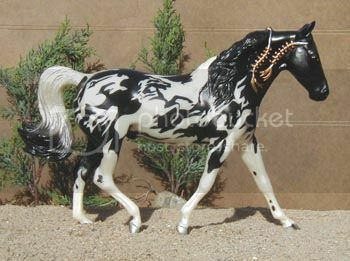 Model information: Breyer "Iron Metal Chief" mold; "Fanfare" special run sold through Breyer's magazine, Just About Horses, celebrating Breyer's 50th anniversary in 2000. 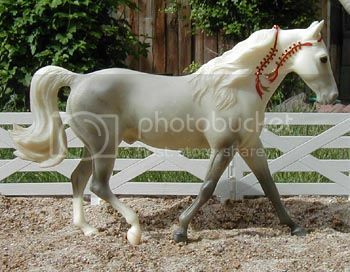 There were 750 models made in each of Breyer's four original "Decorator" colors; this is Gold Charm. Lines to Cap's Iron Duke, Zane Grey, Mr. Koscot[TWH], Merry Boy[TWH]. Awards: Has achieved Superior Champion status with IMEHA. 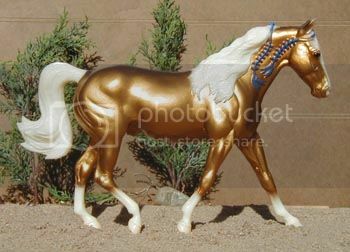 Model information: Breyer "Iron Metal Chief" mold; #971 Iron Metal Chief" Missouri Fox Trotter, 1997 Limited Edition. Lines to Southern Jazz, Merry Boy Sensation, Missouri Traveler E., Zane Grey. Model information: Breyer "Iron Metal Chief" mold; #750198 "Snowflake", 1998 Christmas Horse special run, produced second half of 1998 only. Awards: Live show placed, NAN qualification in collectibility. 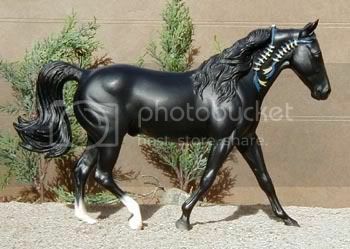 Model information: Breyer "Iron Metal Chief" mold; "Masquerade", Connoisseur series 2001; sold through Breyer's magazine Just About Horses, 350 made.